This past Saturday, October 20, 2012, was the 7th annual Celebrate Samhain event in Peterborough, NH. It was the first year in its new location at the Peterborough Community Center. This was the third year I have attended Celebrate Samhain and the new location made a big difference with regards to the event. The past two years you would rub shoulders with everyone just to attempt to look at vendor tables and if you thought that was an intimate experience, well just wait until you tried to go listen to one of the talks! The new space at the Community Center created spacious vendors areas (and trust me, we’ll be talking about my no holds barred shopping in a little bit) and a comfortable area to listen to talks from the speakers. It also allowed for a separate room for the readers so you could have a little privacy. Before they were wedged between booths on the vendor floor. Even with the new larger space the vendors and event organizers made sure that the Center still looked magical. All right, we might as well talk shopping because readers know that is one of the biggest things I do at Celebrate Samhain. It’s impossible not to because they have some of the best vendors there! Now last year my husband Jim and I went with a list and a plan to get most of our holiday shopping done. This year there was no such agenda. Essentially my plan was, I’m going to be blowing some cash and Jim could either get on board or get out of the way. He got on board, primarily because of Cucina Aurora. 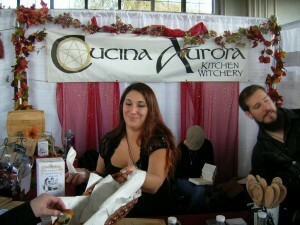 One place I knew we were stopping was Dawn Hunt’s Cucina Aurora booth. Dawn Hunt is a Kitchen Witch whose magical treats and talks are going to build her an empire. Hear the words coming out of mouth because they are true people, get in on the ground floor of this one and you’ll be able to say in your best disinterested hipster voice, “Cucina Aurora? I was totally cooking with her oil forever ago. Where have you been?” Jim is addicted to using her Rosemary Oregano Healing and Peaceful Energy Infused Olive Oil. It’s flavorful, but gentle enough that crazy stomach can handle it. He dips bread in it for snacking, but also cooks chicken in it, sautés all kinds of stuff in it, and when he makes pizza he puts some on the pan and on the dough. It gets used a lot. With that in mind, we bought 4 bottles. Also, after all these years of hearing about how popular Cucina Aurora cookie mixes are, we picked up a Cinnamon Oatmeal Raisin Cookie Mix to try. 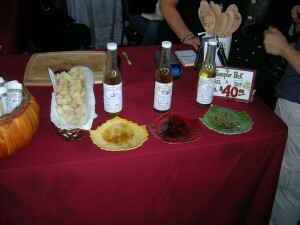 The olive oils being used as dips. Dawn Hunt making sure we're well fed. Next we visited Haunted Wood Crafts. 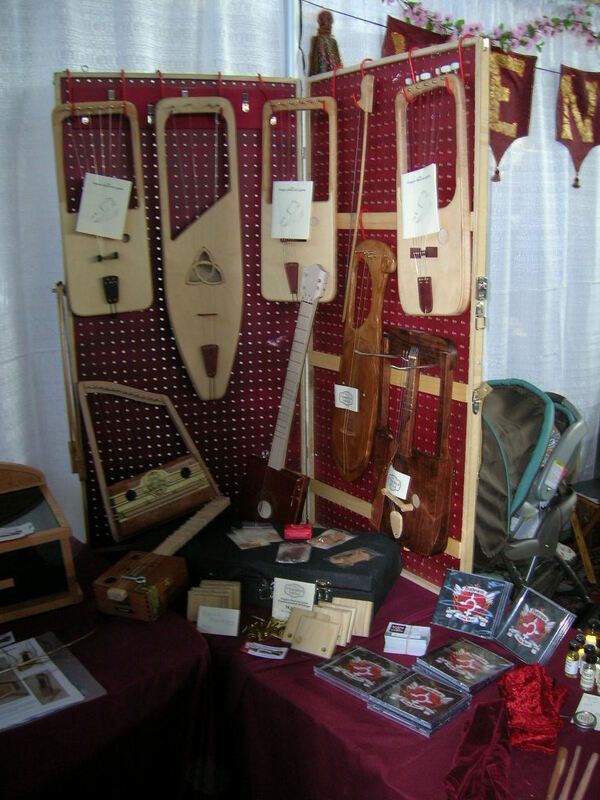 Craftsman and proprietor Mike Dolan was very excited about all the instruments he’s been making lately. I thought they were amazing and beautiful. I particularly like the ones that used cigar boxes. Who doesn’t love the look of a cigar box? He also had handcrafted wands, the wooden tarot prints like we bought last year, a stupidly huge selection of wooden runes, and I’m sure I’m forgetting stuff. I did make a purchase, but I’m keeping it to myself in case it becomes a part of a holiday gift giving idea. Sorry folks, but I bought something there and it was really, really, really cool. That’s all I can say. Awesome instruments at Haunted Wood Crafts. As per usual we visited Fairy Spa. At this point I cannot survive without their Intense Lotion and now I’m totally hooked on their Goat’s Milk Facial Cleansing Bar: For Acne, Eczema, and Psoriasis. I’m so very blessed that at the age of 36 I’m dealing with, at times, some pretty ornery acne. I’m not lying to you, this stuff really works. The only reason at this point that I ever have acne is because I’m too damn stupid and lazy to make sure to wash my face every night with this cleansing bar. 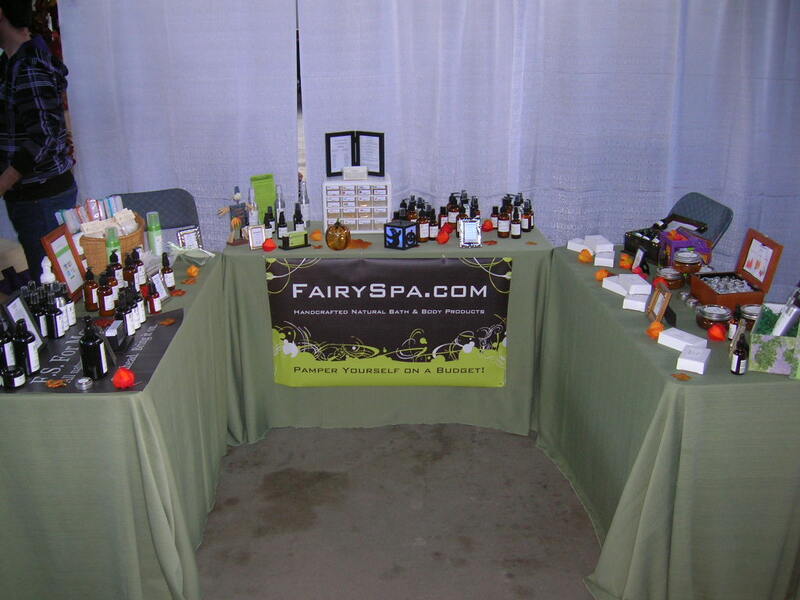 Fairy Spa also has a Men’s line and has branched out into aromatherapy oils. 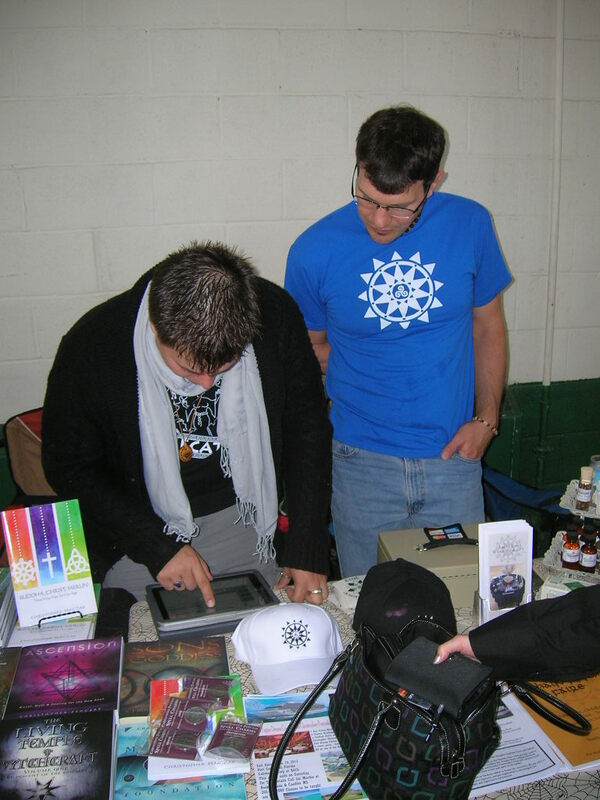 As you can see from the photo of their table at the event, they craft a lot of goodies, and they are all good from my experience. 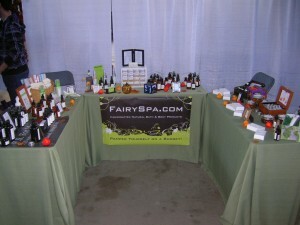 Can you believe all this Fairy Spa stuff? I was happy to see Inkubus Haberdashery at the event because I never got to shop in their store the past years I attended Celebrate Samhain. They brought some of the great clothes their store stocks, but for me, I was all about the great Dia de los Muertos stuff they brought. We bought another set of sugar skull molds in case we need them, an adorable garland for me to put on our door when we celebrate the holiday, and some stickers that I bought planning on giving to kids that come over when we celebrate but may just end up being mine all mine because they’re so cool. I asked when, oh when, will their website be up again so that I may shop from NY. 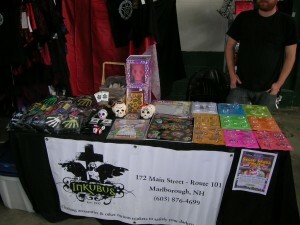 No word yet on when all of us not fortunate enough to live in Marlborough, NH will be able to shop Inkubus online. Inkubus! Their manager Spike is pleased to be mostly out of frame. Adam Sartwell (left) attempts to bend Apple to his will while Steve Kenson (right) looks on. Lastly, we splurged at the Pentacle Press booth. There was a book I kept trying to resist all day and there was a tarot deck Jim was trying to resist all day. However as the day wore on Jim finally admitted he wanted the deck, which allowed me a sigh of relief because I really wanted the book! So Jim got “The Steampunk Tarot” by Barbara Moore and illustrated by Aly Fell (which confidentially I wanted too) and I got “The ABC of Magic Charms” by Elizabeth Pepper. Just some of what Pentacle Press had to offer! 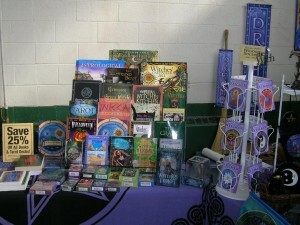 Now before you think there was only shopping at Celebrate Samhain, there was also fun things to do. And we’ll talk about that on Friday!